Our Quality Excellence Award is awarded to a select group of companies who fully recognise the importance of quality and place great value on overall matters of quality management and quality assurance. These companies have, amongst other things, consistently provided invaluable feedback and support regarding the purposeful application of computer aided quality assurance solutions in their individual field of business. 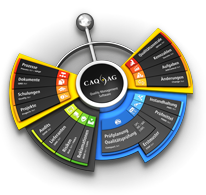 They also command an exemplary CAQ-system and integrate the relevance of CAQ and QM within their companywide communications. We wish to honour these companies for their consistent striving for quality, their comprehensive implementation of the continuous improvement process and their exemplary usage of our CAQ.Net® software solutions.